Served with every meal, the Cheddar Bay Biscuits are one of the signature menu items at Red Lobster. Before grabbing a warm biscuit, take a look at how its calorie content and other nutritional values affects your daily diet. Each Cheddar Bay Biscuit has 150 calories. The calories in the biscuit tell you how much energy you get from it. Calories not used by your body get stored as fat. If you eat 2,000 calories per day, one biscuit represents 7.5 percent of your total daily calories. Red Lobster's Cheddar Bay Biscuits have 8 g of total fat, and that includes 2.5 g of saturated fat, Red Lobster reports in its nutrition facts. The biscuits each contain 350 mg of sodium. That total represents 14.6 percent of the maximum recommended daily intake of 2,400 mg. 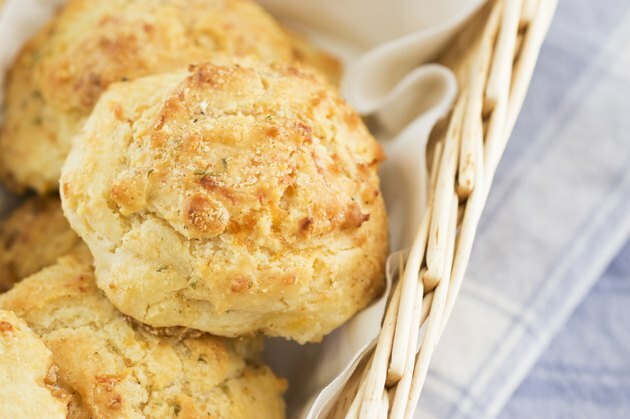 The flour base in the biscuits contributes to its carbohydrate content, with 16 g of total carbohydrates in each biscuit, Red Lobster reports.